The fluorescent yellow and lime green walls of a Mexican restaurant in Ellensburg are forever etched in my mind. It’s mid-May 2015, and Mark and I are there on our way to officiate a wedding in Central Washington. While we wait for our food to arrive, we talk about what could go wrong in front of the 150 guests, and that I keep seeing little black spots in the periphery of my vision. We joke that the restaurant is full of flies, and we laugh it off as a case of overworked eyes. We tuck into our tacos, not understanding the warning sign that -- in hindsight -- seems as obvious as the glaring wall colors. Early one morning a week after the wedding, I am standing in front of the bathroom mirror. My vision has steadily deteriorated to the point where I struggle to use a computer or read. In the gray light, I do something I've never done before: I check one eye at a time. I learn that what I thought was a general vision problem is really a problem with my left eye. Staring at my reflection with just my left eye, the right side of me disappears into a gray blob. Part of me is not there. I mope around the house with my new discovery, but take no action. Mark though isn't having any of it; he sets up an appointment for a checkup with our optometrist. On the ship of my health, I'm not the captain, more a helpless deckhand. Writing this now, I want to reach back in time and slap myself. The day of the checkup and the following ones blurred together in a series of doctors, waiting rooms, and dread as my eyesight worsened and we did not know the cause or prognosis. On a Tuesday afternoon in early June, we are with Dr. Doan, a short, confident UW Eye Institute fellow. She specializes in diseases of the retina. The exam room is midnight blue, full of expensive equipment and a large model of an eye. Dr. Doan jumps around the room in her white coat getting me ready for an exam. "Look to the right buddy," Dr. Doan says as she stares into my eyes with one her instruments. She calls me "buddy" and shoots from the hip. She uses the eye model to give Mark and I a 101-intro to the world inside our eyes, introducing terms like macula, fovea, and cone cells. I've come to believe that learning new vocabulary in a medical setting is rarely a good thing. Dr. Doan describes the macula -- the prime real estate of the eye as she calls it -- as resembling an open book viewed from its bottom or top edge. The two sides of the macular book curve up and fall into the binding crevice. The area around the crevice is the fovea, which contains cone cells responsible for sharp central vision. My left eye looks like a book that someone left out in the rain, warped and wrinkled, not smooth and not functioning fully. Left: An open book. 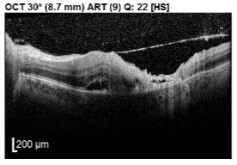 Center: Cross section of inflamed macular area. Right: Retina with lesions. Looking at a three-dimensional scan of my left eye, Dr. Doan delivers the news in a matter of fact way, as if she were perusing a menu: my cone cells are gone and are never coming back. A sick feeling wells up in my stomach, similar to the one several minutes later when she inserts a needle into my left eye to deliver antiviral medicine directly to my warped book. Dr. Doan tells us a much as she knows. The black spots -- my flies on the wall in the restaurant -- are floaters, which are often immune cells clumped together, my body protecting against an invader. The damaged area of my left eye is the ground zero of the invasion. Dr. Doan can see the battlefield, but she doesn't know who the invader is. She is puzzled and curious, a detective at heart. She talks about what we can rule in and rule out. Even more sobering is her focus on "saving" my right eye. I feel more desperate than ever to find out what my immune system is battling inside my eye and to not lose any more vision. Why did I wait so long? The detective calls two days later. She has an answer. The blood work she ordered revealed that we are dealing with toxoplasmosis. Toxoplasmosis is a parasitic disease caused by the single-celled organism Toxoplasma gondii. The etymology of the name gives clues to its look and history; toxoplasma refers to the crescent-shaped form of the cells, and gondii refers to the gundi rodent in which the parasite was first identified over 100 years ago. Most people know toxoplasmosis as the pregnant-women-shouldn't-clean-cat-litter-boxes disease. The prevalence of toxoplasmosis in the U.S. is between 20 and 30 percent, with most cases being asymptomatic. Unfortunately, mine isn't. I've been immunosuppressed and living on the edge for years dealing with ulcerative colitis. Onboarding this parasite, along with a host of other problems, has always been a possibility. I mistook my luck up to this point for invincibility perhaps. If I got something, I reasoned, I could beat it with modern medicine. Dumb luck or not careful enough, I ingested the parasite's cysts and didn't understand the symptoms until too late. Dr. Doan says my case is atypical, but that doesn't make me feel any better. The treatments I've had up to the diagnosis focused on a viral cause. Toxoplasmosis is a parasite and doesn't respond to antiviral drugs. So I find myself once more on my back looking up and watching Dr. Doan bearing down with a needle, this time full of an antibiotic for my embattled eye. After she is done, I'm sweaty and white as a ghost. "Breathe buddy, breathe," she says. Since the toxoplasmosis attack, my change in vision dictates that I slow down and rethink daily activities like cutting fruit for breakfast, walking, working in the yard, and reading. The future includes long-term antibiotics, regular visits to check my eyes, protecting my good eye, and getting to know what to look for in the next possible outbreak. Yes, the parasite hunkers down, quiescent, in the scars bordering the battlefield and waits. No one knows what will trigger the parasite to resurrect and attack again. Through it all, I'm puzzled why I waited so long to act. In fact, I didn't act at all. It was Mark who did, making the initial appointment that started the process of healing, or, more aptly, stemming the tide. When I got the diagnosis, my engineering instinct kicked in to analyze sequences of events, assign probabilities, and counterproductively, assign blame. Did I prioritize my health too low? Did my doctors warn me enough about being immunosuppressed? Is there a flaw in my prioritization of what's important in life? Was I not educated enough to recognize the signs? Was I too cocky about my health? I was mired in hindsight. As the urge to rewind the tape and replay the events fades, acceptance and foresight slowly replaces hindsight. I mentally prepare for a relapse of toxoplasmosis or threats from other serious infections such as from listeria or tuberculosis. I rehearse advice I've noticed I now give freely to others, which is this: don't wait to ask when it comes to something about your health. When I wake in the morning now, I instinctively test my eyes. In my left eye, the gray spot shows up, fuzzy and dead center. Has it grown? Is my right eye okay? In the seconds it takes to run through these tests, a compressed version of those uncertain months -- from noticing the problem to halting its advance – passes through my mind. It’s but a glance in the rear-view mirror because my eyes are now squarely on the road ahead.